The affordable LG K30 made its debut in the United States early this month at US retailer T-Mobile, but Amazon offers a much better deal if you absolutely want to own this smartphone. 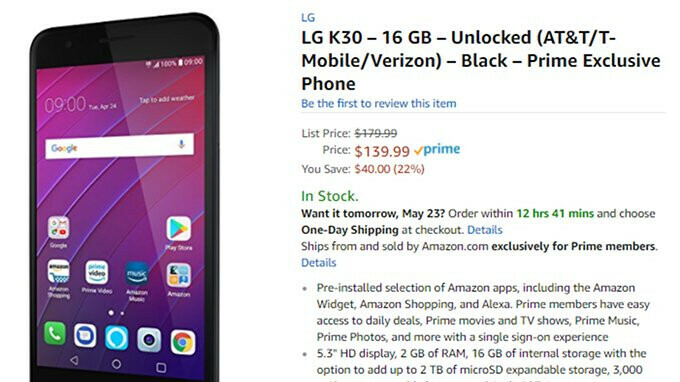 Unlike T-Mobile, which sells the smartphone for $225 outright, Amazon offers the LG K30 for just $140. The fact that it's available as a Prime Exclusive smartphone is probably the main reason the device is so much cheaper than T-Mobile's version. It's also worth mentioning that Amazon is selling the 16GB model, whereas T-Mobile's model comes with 32GB storage inside. Also, the LG K30 usually costs $180, but Amazon has it on sale, so those who purchase it will save $40 (22%). Keep in mind that since this is a Prime Exclusive smartphone, it comes with Amazon apps pre-installed, including the Amazon Widget, Amazon Shopping, and Alexa. Specs-wise, the K30 is clearly an entry-level device, which ships with Android Nougat on board. The smartphone packs a 1.4GHz quad-core Qualcomm Snapdragon 425 processor, 2GB RAM, and 16GB expandable storage. It also sports a 5.2-inch display with HD (720p) resolution, an 8-megapixel main camera, a secondary 5-megapixel selfie camera and a 3,000 mAh non-removable battery. The LG K30 comes unlocked and it will work with major carriers in the United States such as AT&T, T-Mobile, and Verizon. Even at $133, the specs are bad for the price.. The only appealing phone th LG does is V series. And the opposite mid to low end segment which is frankly speaking trash. The Q7 might be good but the chipset is unknown at this point.